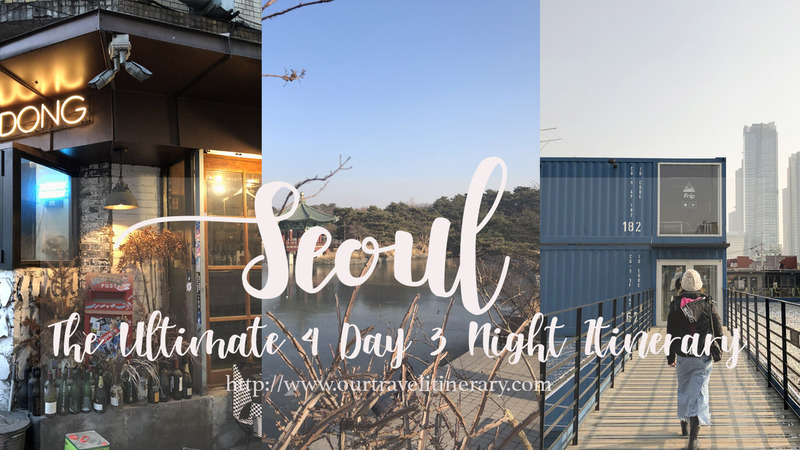 Home #Itinerary 4 Day 3 Night Seoul Itinerary Hotel in Korea Korea korea itinerary seoul seoul itinerary Things to do in Seoul 4 Day 3 Night Seoul Itinerary / Hidden Gems, Michelin Bib Gourmand Restaurants & where to find them in Seoul! This trip to Seoul was confirmed only 2 days before our flight. Probably one of the craziest things we have done together. Despite being a last minute trip, this is so far the best trip to Seoul. We explored new places, visited Michelin Bib Gourmand restaurants and ate a lot! Here’s what we did and I hope you enjoy Seoul as much as we did! 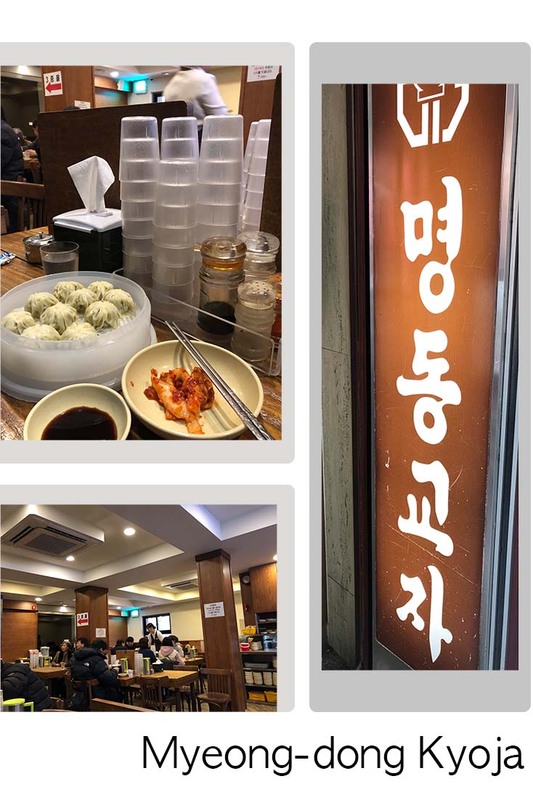 After checking into our hotel at Solaria Nishitetsu Hotel Seoul, we immediately head for the famous Myeongdong Kyoja for breakfast. There are only 4 items on the menu and I read that their dumpling is good. So we went straight for the pork dumpling (10,000 Won). Each dumpling is fresh and filled with lots of meat. Juicy and flavorful! I wasn’t surprised that they were awarded the Michelin Bib Gourmand. Definitely not the cheapest dumpling but it is worth the money. There are 2 outlets in Myeongdong and we went to the main shop which is located opposite our hotel - Solaria Nishitetsu Hotel Seoul. Be there early and avoid the crowd! After having the dumplings, we visited Migabon Restaurant aka Well-being Porridge for a second round. 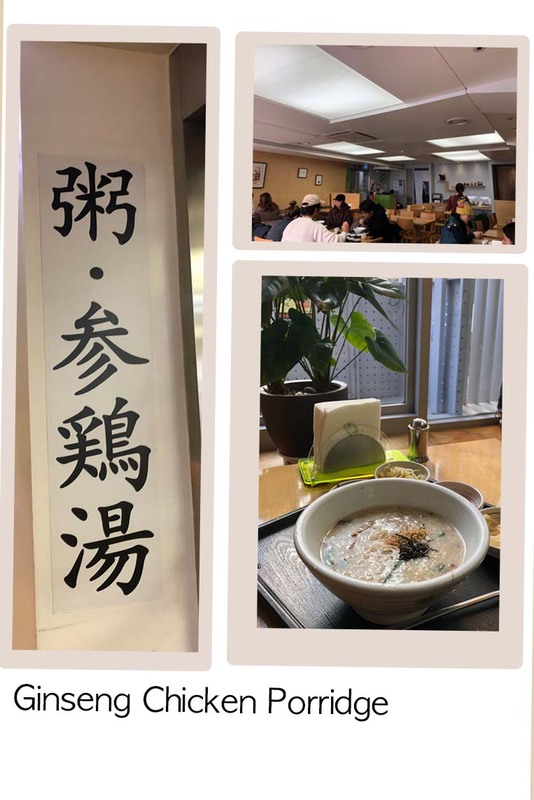 Located on the next street, this restaurant is famous for its porridge. We tried the shop's recommended Ginseng Chicken Porridge (8000 Won) and it didn’t disappoint. The porridge is light yet flavorful. The perfect meal for the cool winter weather. After a satisfying breakfast, we visited one of the hipster places in Seoul. It is made up of 200 large containers. Inside the containers, you can find artsy shops and restaurants. 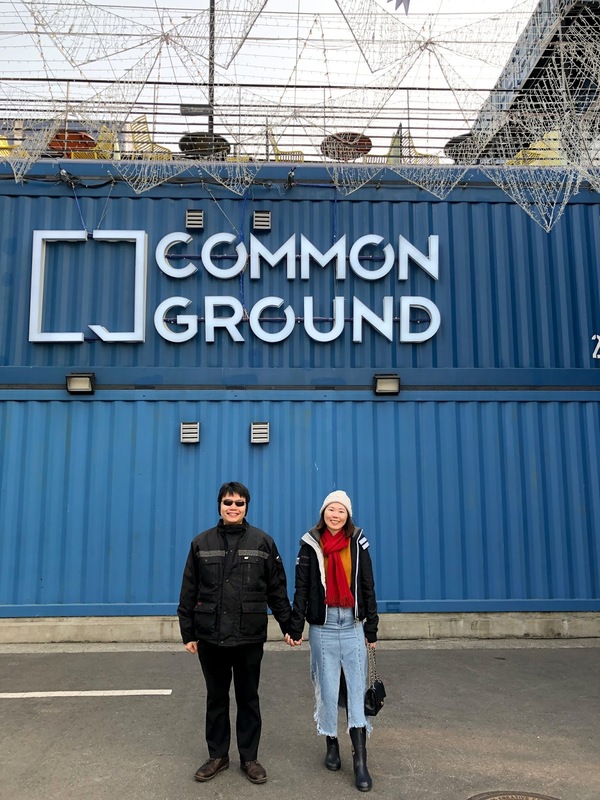 We visited on a Friday afternoon and although nothing caught our eyes, we still think the container architecture is pretty cool & definitely a nice place to take your insta-worthy photos here. After visiting the pop-up stores at the common ground, head over to Starfield Coex Library, one of the most interesting libraries in Seoul. 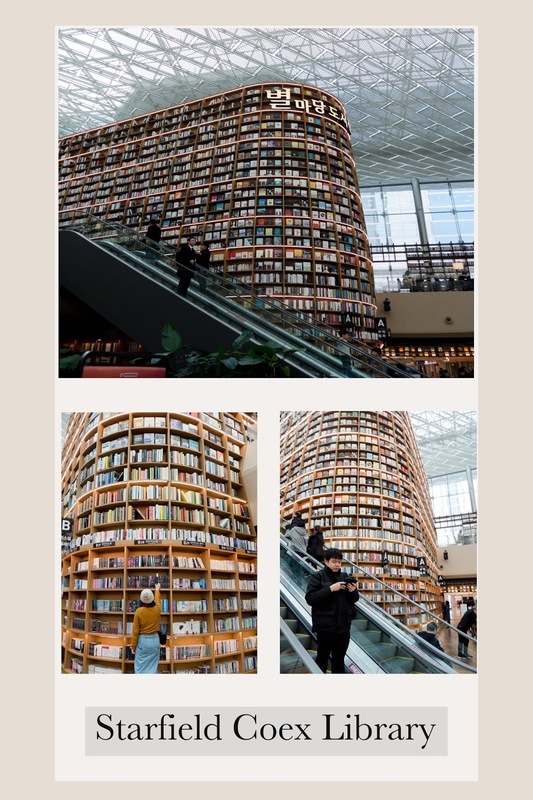 The library is an open concept library that is lined up with 13m tall giant bookshelves filled with books. Plus, the interior design and layout of the library are very unique. What’s more is that there are performances with different themes every day. We didn’t manage to catch one but being in the library is pretty awesome. The Royal Tomb aka Seonjeongneung a UNESCO World Heritage located in one of the most expensive piece of land in Seoul - Gangnam. 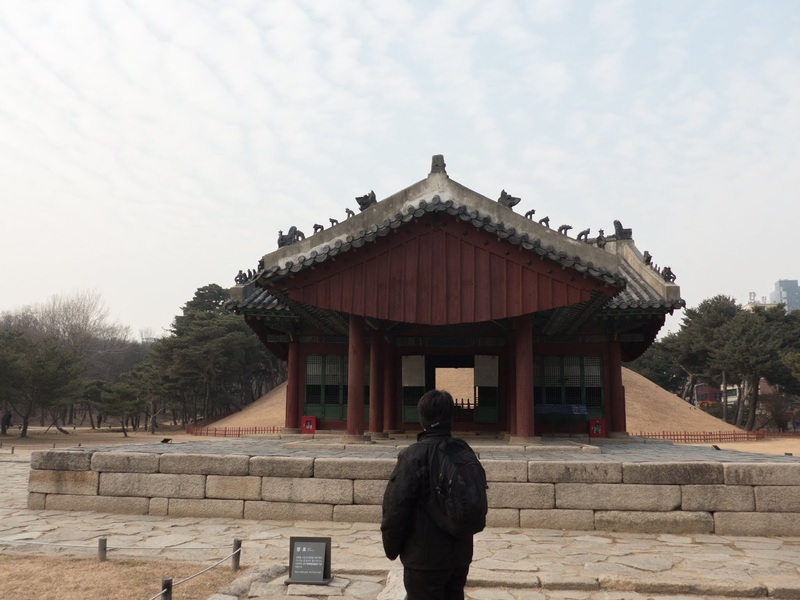 This place comprises the tomb of King Seongjong, Queen Jeonghyeon and King Jungjong of the Joseon Dynasty. The royal tomb park is huge and we spent some time exploring that place and it is huge. Despite located in the prime area, this park is quiet and peaceful. There was no crowd, only a couple of park-goer. We pretty enjoyed our time there! Honestly, Seoul is very crowded. If you are a Kpop fan then you shouldn’t miss the K-Star Road. 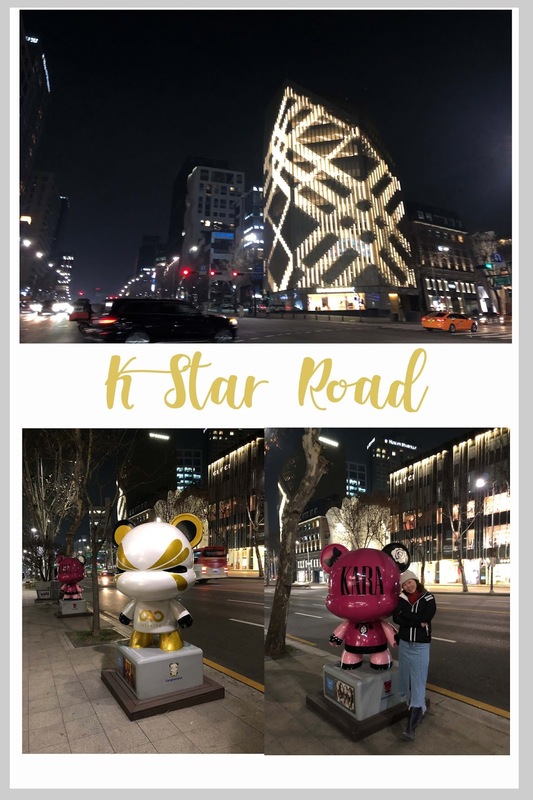 Located along the main road connecting Apujeong Rodeo Station Exit 2 and Cheongdam crossroad, you will find many bear doll sculpture located along the road. Other than the bear doll sculpture, the street is also the luxury road of Cheongdam. You can find many luxury shops such as Chanel, LV, Dior and etc. However, do visit that road in the afternoon as most of the luxury shop close at 8pm. We went there after our dinner and found ourselves in a ghost town. Just kidding. I meant no crowd! Jokbal was in our list of things to eat in this trip. However, we didn’t want to settle for just an average meal. We wanted to make every calorie worth it. Even though Ogane Jokbal was located at a more secluded area, we still went ahead. That’s how crazy we are. So, we arrived at the quiet neighbourhood before dinner time. After searching around, we found ourselves alone in the street and the restaurant closed. Like what? Thankfully, the Ajuma was very nice. She opens the door and welcome us well. We ordered the Jokbal (35000 won – Small, 39000 won - Large) small portion for 2-3pax. When it was served, we were taken aback. I even ask her if this is the small portion. Initially, we thought we couldn’t finish the food because it was too much. However, the Jokbal was so good and we managed to finish it all! The Jokbal’s skin was chewy and soft. We didn’t get sick of it and finished the whole plate. Plus, the meat was tender and very flavourful. Jokbal is best eaten with vegetables! So make sure you ask for more vegetables to wrap! Honestly, this is one of the best meals we had in Seoul. Not only that the food is great, but the Ajuma is also really warm and friendly. She even prepares the food for us even before the 5pm evening opening hour. How many restaurant owners does that? Plus, we all know that Seoul is definitely not the place where you would find friendly people everywhere you go. So, H & I are really grateful and touched by her hospitality. Despite having our dinner at Ogane Jokbal, we managed to share a bowl of Kalguksu (8000 won) & thankfully we did. It was my first Kalguksu so I didn’t know what to expect. The excitement wasn’t as strong as when we were visiting Ogane Jokbal. However, once I saw the clam aka lala in the bowl of noodle, my eyes lit up. Kalguksu is a noodle dish cooked with fresh ingredients. The one at Sandong Kalguksu has a chewy noodle. I find it pretty hard so I didn’t really like it. However, the broth tastes superb. The broth is flavourful and I could taste the naturally sweet taste from the clams & yes, we finished the broth. It’s so good! If you are in that area, do visit the restaurant! There’s a crowd there so expect to wait a little while. However, everyone come and go off pretty fast. So the queue shouldn’t be too long. If the breakfast in Tong-in Traditional market is not satisfying enough, visit Tosokchon for a bowl of Samyangtang aka Ginseng Chicken Soup. This hanok-style restaurant is famous for its ginseng chicken and you get to choose from a list of style from the menu. Example: Black chicken or Normal Chicken with Wild Ginseng or Normal Ginseng & etc. Most of the soup consisted of a whole chicken stuffed with rice and herbs. I remembered not being a fan of Samyantang because the one I tried before was light and almost tasteless. However, the Samyangtang at Tosokchon is very different. The broth is rich, milky and flavourful. Oh and remember to add the ginseng into the soup soak it awhile to have more “ginseng” taste because the original broth has more of the herb taste. Other than the broth, we enjoyed the chicken! The meat came off the bone easily and was very tender! Despite having a seating capacity of 400, this place is very crowded. Thus, if possible, come during off-peak! We visited after lunch hour and only had to wait 10 minutes to get in. Gyeongbokgong Palace, one of the grand palace in Korea, was the main royal palace during the Joseon Dynasty. If you are a huge fan of K drama, you will not miss this. Otherwise, go watch one of my favourite Korean drama Moon Embracing the Sun! Despite being grand and beautiful, it did not escape WW2. The palace was destroyed during the Japanese occupation and the Korean government aim to restore the palace by 2040. The palace is huge and one can spend at least 2hours there. Highly recommend joining their free tour as the guide will share the stories behind every scene. Besides, one can dressed in Hanbok and explore the palace like a Princess or King if you want to! There are many traditional Hanbok costume shop near Gyeongbokgong! Otherwise, you can plan in advance and book from Klook or TRAZY to save some bucks! If you are early, you can even catch the changing of guard ceremony! As this was my 4th trip to Seoul, we didn’t want to go to the usual tourist street. 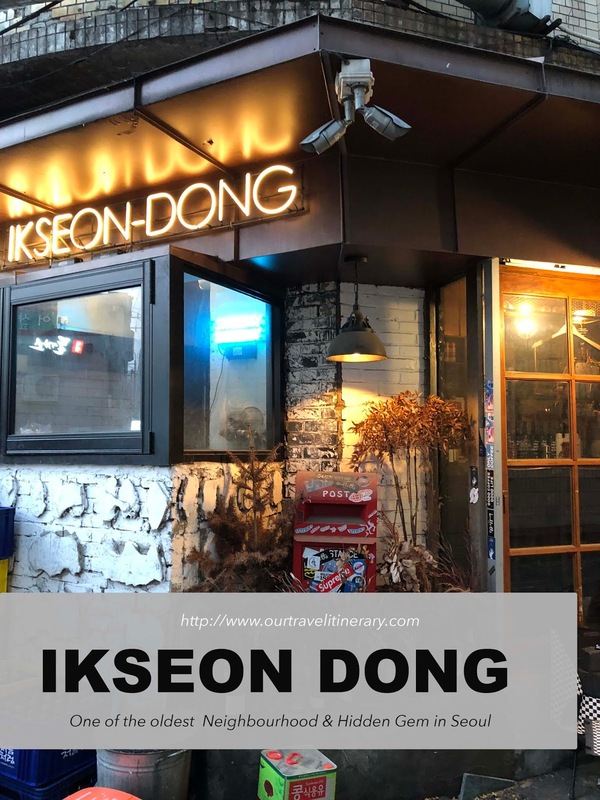 Thus, we did some research and came across Ikseon Dong - one of the hidden gems in Seoul. Ikseon dong is one oldest neighbourhood in Seoul and it has transformed into one of the hippest places in Seoul today. There are many handicraft shops, cafes and restaurants in every alley. We visited Holiday Bakery Café and even had dinner at one of the local BBQ restaurants! Click here to read more about our trip at Ikseon Dong and how to get there! Noryangjin, the largest fish market in Seoul is a popular place for tourist to get hold of fresh seafood. There are many seafood stores that sell similar stuff so if you are a seafood fan and know how to bargain, this place is a great place for you! However, our experience in Noryangjin wasn’t great. When we arrived at the market we were being touted to buy the seafoods and many stores and vendors were very aggressive. In the end, we didn’t buy any and left. Comparing to its neighbouring country, the experience is a little overwhelming. After the visit to the fish market, we visited Okeunnae Chicken Rib for Dak Gal Bi. The Michelin Bib Gourmet Restaurant is located 15 minutes walk away from Yong san station. Dakgalbi, the spicy stir-fried chicken, is one of the popular dishes among Korean. If you love Yoogane, you will love Okeunnae Chicken Rib! The chicken is tender, seasoned perfectly and very addictive! You can have the chicken on its own or do it the Korean way! Wrap it with lettuce! The table next to us top up cheese to their Dakgalbi and it looks amazing too! Do give the steam egg aka Gyeran-jjim a try! It is cook with egg roe and has a strong seafood finishing taste! Plus, the burnt taste from the pot makes it even better! Before you finish your chicken, remember to ask for fried rice! It’s so good! I thought I couldn’t finish them because they were very generous with the meat portion. I was wrong! The fried rice is even better than wrapping it with lettuce! To be honest, this is our favourite meal in Seoul. So delicious and affordable! We will definitely be back if we have a chance! The small and old school looking restaurant can only accommodate about 10 tables. Thus, you need to come during off-peak hours to get a seat. After a very satisfying lunch, we visited the National Museum of Korea. The museum is huge yet very organised! One can understand Korea history by walking through different dynasty exhibits. The timeline and information on the board made it easy for us to understand. It would have been better if we visited this museum on our first day or even before visiting Gyeongbokgong Palace and the Royal Tomb in Gangnam. One of the food that I always have when I’m in Korea is Chi-Mae 치맥. 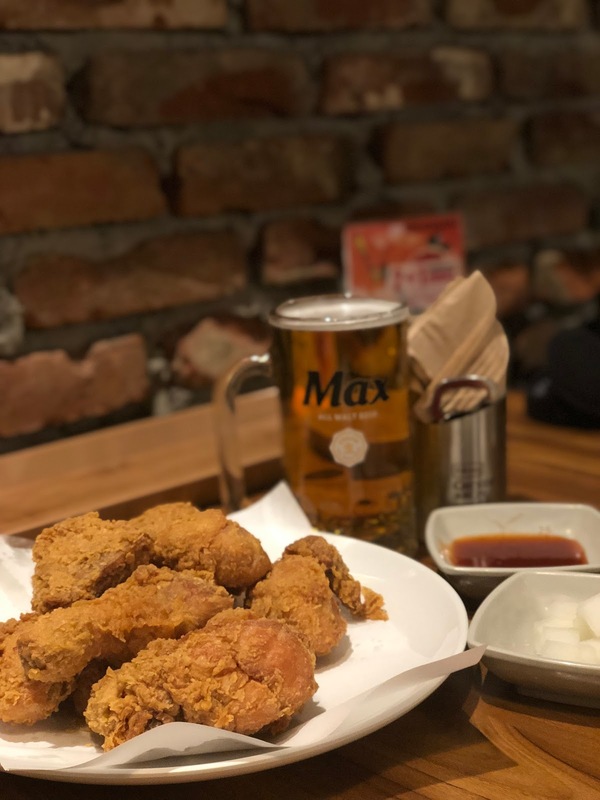 Chi-Mae aka Fried Chicken + Beer (Chi – Fried chicken, Maekju – Beer). We visited BBQ Myeong Dong for fried chicken. If you are a fan of Goblin Korean drama, I’m sure you will recognise that place. According to them, the fried chicken is prepared with 100% extra virgin olive oil. Healthier choice of fried chicken. We ordered the Golden Olive Chicken since it is the most popular item on the menu. The Olive fried chicken was crispy and tender but I had better-fried chicken in Korea so this was considered below average. Perhaps the healthier choice of oil makes the difference? We took a bus from Myeongdong and arrived at the bottom of N Seoul Tower. It was 5 degree that night. Despite the cold weather, the lights and atmosphere there warmed our soul. Nanemyeon is a unique dish found in Korean. Unlike the usual cold noodle, the noodle from Eulji Myeonok is Pyongyang style. The soup was light and had a clean after taste. Very different from the ones we usually have. Other than the beef cold noodle, one can try the red sauce cold noodle. The sauce is sweeter and has a stronger taste. I didn’t really like the Pyongyang style but H beg differs. He finished both bowl of cold noodle. Overall we find that it is a good experience since we didn’t have a chance to visit North Korea. However, I felt that the price is a little steep for 2 bowl of cold noodle with little meat? 11,000 won per bowl is very expensive. Hanuel Park, one of the five parks in World Cup Park, used to be a waste landfill. Today, it has become one of the most Instagrammable places in Seoul. One can reach the park by walking up the 291 steps or take the park’s electric tram for a small fee. We came at a wrong time. Most of the grasses were dried and removed. Thankfully, there is still a small area left. I can’t imagine how beautiful that place would be in autumn. We spent our afternoon at the park walking in-between the bushes and snapping away. Perks of visiting the park during off-peak is that there is less crowd! The café scene in Seoul is very competitive and most people are always on the lookout for the popular ones or Instagram worthy café. Unlike others, Belief Coffee Roast is one that serves really good coffee and pastries! We chance upon this café while we plan to visit Okdongsik. The café looks quiet on the outside. Even after we purchase our coffee and pastries, we didn’t realise that there is a basement! Guess what, the basement is HUGE. & I love the interior design! The setting is like a school compound and makes it very cosy. What makes them stand out is definitely the quality of coffee and food! This is what H & I always look for when we travel. They even have their own roastery to roast their own beans! & they even conduct classes as well! Don’t be fool by the google rating of only 12 reviews because when you search this café in Korean in google map, you will be surprised! This café is definitely a hidden gem and under the tourist radar! Dinner: Enjoy top-notch dining experience at Okdongsik at an affordable price. When H told me that he wanted to have pork soup rice, I didn’t know what that was. Korean version of Bak-Gu-Teh? Dwaeji-gukbap aka Pork Soup Rice is a simple Korean cuisine that is served with slices of tender pork in soup with rice. There is only 1 dish on the menu. So we were asked if we would like to have regular (8000w) or upsize(14000w). Unlike the strong pork soup I usually had back home, this soul is light and refreshing! The kind of soup that you want to have during winter or prepared by your mom. No MSG was added and the meat was really fresh! I had it with the kimchi and it was superb! H even save some of the pork in his bowl for me. This Michelin Bib Gourmand restaurant is definitely worth going. We love the quiet and clean ambience. Plus, there are only 10 seats in the restaurant. So this makes the dining experience very intimate. Do go during the off-peak period because it is very popular. Plus, they only sell 100 bowls of rice soup daily. So yup, good luck!